Graduate student Danica Harbaugh presented the keynote address to an international conference on sandalwood research. 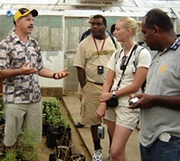 The conference was held 28 November to 1 December 2005 in Nadi on the island of Fiji. Participants were invited from Pacific island countries and territories with additional representatives from Australia, Indonesia, Timor Leste, and the United States. The conference dealt with sandalwood research, development, and extension work in Pacific island countries and territories. Danica's dissertation research focuses on reconstructing the phylogeny of the genus Santalum (Santalaceae) which includes the sandalwoods (commonly known for their use in the essential oil industry). She is interested in determining the evolutionary relationships of the taxa as well as in elucidating dispersal patterns of the genus throughout its distribution (Australia, India, Indonesia and the Pacific Islands). In addition, she is working on a taxonomic revision of Santalum and a monograph of the genus. The index to Jepson's Flora of California has been completed by Tim Kask. It includes more than 12,000 names and synonyms. Chris Meacham, funded by a grant from the Lawrence R. Heckard Fund of the Jepson Herbarium, has produced a new version of MEKAEDIT, the program by which keys are constructed in MEKA. The new version takes advantage of Windows features to make key-building easier and more flexible. It also includes a converter so that MEKA keys may be displayed on the Web. MEKAEDIT, bundled with MEKA and keys to >150 genera of California Asteraceae, can be freely downloaded and distributed. The multiple-entry keys for >150 genera, mostly of Asteraceae, that have been so far available only as as a download, have been converted by Chris Meacham to a format (SLIKS) that can be displayed directly in a browser. All the keys are listed on one page and each generic key is listed with the appropriate Interchange genus page (e.g. Ageratina) and linked to the Manual taxonomic treatments (e.g., Ageratina adenophora). During the BSA banquet at the Botany 2004 conference in Snowbird, UT, Danica Harbaugh was awarded the Lawrence Memorial Award, which commemorates the achievements of the founding director, Dr. George H.M. Lawrence, of the Hunt Institute of Botanical Documentation at Carnegie Mellon University. The annual award of $2000 is given to a doctoral candidate for travel as part of dissertation research in systematic botany or horticulture. Danica used the funding to conduct fieldwork in Australia in August-September 2004, as part of her dissertation on the phylogeny and taxonomy of the sandalwoods (Santalum, Santalaceae). The index to Jepson's unfinished Flora of California has been expanded by Tim Kask so that it now includes more than 9000 names and synonyms. Tim has completed volumes 1 and 2 and is beginning work on volume 3. This is the first time that the Flora has been comprehensively indexed. Links to names in the Flora are now provided in many of the online accounts. Searches in the Interchange now include the Flora index. The brochure for the Jepson Weekend Workshops and other public programs is out. Here is an electronic version. The use of native plants in restoration efforts and home gardens is an important conservation strategy. Up to now, the Jepson Herbarium has contributed to this effort through the publication of horticultural information in The Jepson Manual. To increase our support of native plant horticulture, the Herbarium has developed a horticultural database that provides new and innovative ways to access the large amount of morphological and horticultural data that already exists for ~3000 taxa in The Jepson Manual. What plants will grow well in a particular climate zone? What plants will grow well in a particular climate zone if they have moderate summer	water? What plants will grow well in my shady back yard and sunny front yard? Do cultivars exist for a particular species? The Jepson Herbarium gratefully acknowledges the Elvenia J. Slosson Endowment Fund for support of this project. The New York Botanical Garden Press has recently released this new Memoir. Now, the fern flora for the entire continent of North America, including Central America, is covered with this new flora, together with the Flora of North America North of Mexico, Vol. 2, (Oxford Univ. Press, 1993) and the Flora Mesoamericana, Vol. 1, (Universidad National Autonoma de Mexico, 1995). Why should California botanical enthusiasts take notice? 52 of the 104 fern species found in California also occur in Mexico. The book can be purchased from The New York Botanical Garden Press, 200th Street and Kazimiroff Boulevard, Bronx, New York 10458-5126 or http://www.nybg.org. It is $125, Hardbound, ISBN 0-89327-458-5. University and Jepson Herbaria Director Brent Mishler is co-PI on a new grant to sequence the full nuclear genome of the moss Physcomitrella patens. The project involves an international collaboration of systematic, evolutionary, and molecular biologists. The sequencing will be done at the Joint Genome Institute in Walnut Creek. Since the Physcomitrella plants in culture are mostly from the British Isles and Japan, Mishler wanted to collect samples this fall of plants from California for comparative purposes. The old specimens in the herbarium collections came from the dried margins of local reservoirs, which is where Mishler and other UC bryologists are looking. Just last week Research Botanist Dan Norris found it from San Pablo Reservoir! The new collections will now be cultured and put in the pipeline for genetic analysis, and also used to help clarify the difficult species-level taxonomy. In addition to systematics, results from the sequencing study will provide essential data for studies of evolution, ecology, physiology, and functional genomics -- showing the synergism that can come from collaborations involving systematics and molecular biolgists; natural history museums and genome centers.